HGH For Weight Loss - Can You Really Lose Weight? Human Growth Hormone (HGH) is a naturally occurring hormone in the body. It is produced by the pituitary gland and the hormone plays a crucial role in the growth and development of children. The hormone also plays an important role in certain bodily functions such as tissue repair, brain function, muscle growth, metabolism and energy throughout life. The peak HGH production occurs during the teenage years and it gradually declines as a person gets older. Studies have shown that obese adults have lower levels of HGH when compared to adults with normal weight. This is one of the primary reasons experts started considering HGH therapy for enhancing weight loss especially in overweight and obese people. There are clinics such as National HRT which are offering HGH therapy for different purposes including weight loss in both men and women. The hormone has become a popular supplement for building muscle but it is already banned in the Olympics and certain sports. At the moment, there is not enough evidence that it is effective in boosting athletic performance. However, hormone replacement therapy (HRT) clinics are offering HGH therapy claiming it can help treat aging problems including sexual problems, joint pain, reduced muscle mass, strength decline, low energy level, sagging skin, mood changes, increased weight gain, etc. There are some small studies that have linked the use of HGH (injection form) with muscle gain and fat loss. However, the changes are only minimal yet the risks and possible side effects are significant. Remember that HGH use is not approved by the FDA (Food and Drug Administration) when it comes to weight loss. The interest in HGH use to lose weight started from a study published in the New England Journal of Medicine (back in 1990) which showed that synthetic HGH injection resulted in 14% body fat loss and 8.8% muscle gain. This is without any change in physical activity level and diet. The study seemed to be promising but later studies didn’t indicate such benefit due to unclear reasons. As a matter of fact, the misuse of the 1990 HGH study was denounced by the New England Journal of Medicine in March 2003. A study on adults with HGH deficiency due to pituitary disease who were given HGH therapy showed that it can help improve body composition. The treatment resulted to increased bone and muscle mass while decreasing body fat. However, an endocrinology expert, Nicholas Tritos, MD says it is not an effective weight loss treatment for obese individuals. He co-authored an analysis that evaluated HGH use for weight loss in obese people. The analysis only showed minimal improvements in body composition with a little muscle mass increase and some body fat reduction. However, the weight of the participants didn’t really change. 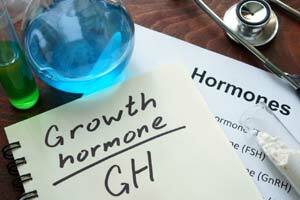 More significant changes are seen on people who have pituitary disease which causes growth hormone deficiency. There are other studies having the same conclusion, indicating that HGH is not an effective weight loss solution for treating obesity. Take note that the American Association of Clinical Endocrinologists has issued a warning stating that HGH use for obesity treatment is not recommended. There are many companies that are offering HGH pills and powders claiming that the products are as effective as the injected form of the hormone. However, medical experts agree that it is only effective when injected. This is why it is recommended to go to HRT clinics for HGH therapy instead of wasting hundreds of dollars on HGH pills and powders. Any drug that it not tested or approved by the FDA is risky and its purity, sterility and safety are uncertain. The truth of the matter is that you really don’t know what’s in most of the oral supplements being sold on the market. Moreover, HGH is a protein that will be broken down in the stomach so it is not really effective unless injected. Therefore, do not waste any money on oral HGH products including pills and powders as these are obviously useless. HGH use for weight loss is not approved by the FDA due to safety issues and lack of evidence that it is really effective. HGH therapy has certain uses and more experts are prescribing it for different reasons.However, you should only deal with reputable clinics like National HRT in order to ensure your safety. Their blog will throw more light on this topic. Remember that HGH in oral form is not effective since it will be broken down in the stomach. This is the reason you shouldn’t waste money on the HGH pills and powders that are mostly being sold online.